Before getting into the Scriptures for today, I thought I we’d have a little educational session about what we might experience tomorrow afternoon if the clouds stay away. I’m sure you all know we’re having a near total eclipse. Drive just 70 miles north and the sun will be completely gone. In ancient times, before they were understood, eclipses were something to be feared. If they occurred on a Saturday, church would be packed on a Sunday. They were thought to be a bad omen, letting people know something evil that was about to happen. Scripture doesn’t help. The prophet Joel speaks of the sun and moon darkening and the Gospels tells us that during the crucifixion, darkness descended on the land. The darkening of the sun is troubling. Of course, we know what causes an eclipse. So enjoy the show tomorrow and stay safe. Having just come back from North Carolina, I can assure you the electronic signs on 95 are already warning people to expect heavy traffic as everyone tries to get into the totality of the moon’s shadow. 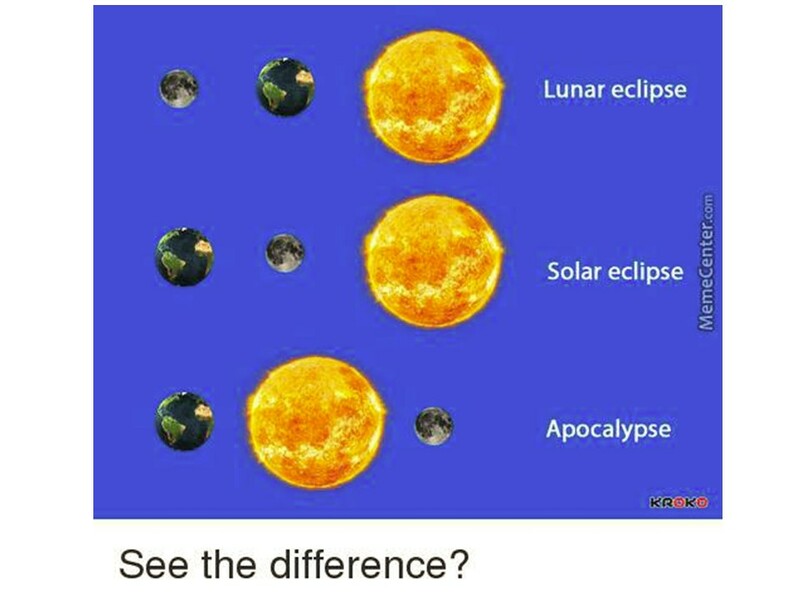 As you can see on this diagram I found on Facebook, there are three kinds of eclipses. Lunar eclipses are frequent. This makes sense, for the earth is much larger than the moon so it is easier for the moon to be in the earth’s shadow. Solar eclipses, like we’ll have tomorrow (and you may have to be in a plane above the clouds to see it), is when the moon is between the sun and its shadow crosses the earth. With the moon being much smaller, things have to line up just right for the shadow to make it across the face of the earth. Solar eclipses are much less frequent than lunar ones. As for the final type of eclipse, when the sun moves between the earth and moon, lets me just say those $3.99 eclipse glasses won’t do you much good. Also, you might need to stock up on some real strong sunscreen. Thankfully, we don’t have to worry about it happening, and if it did we’d be home with Jesus earlier than planned. Regardless, God is with us as we’re going to see in our scripture lesson this morning. We’re still looking at the stories of Jacob. Today and next week we’re going to see him try to free himself from his father-in-law, Laban. Two weeks ago, we saw how Laban got the best of Jacob, as he had to work twice as long to earn the hand of the girl he loved. Today we will see how Jacob gets back at Laban. In between these two events, Jacob is blessed with a host of boys! Remember what I said two weeks ago. There’s humor in these stories. Imagine folks telling what Jacob did around a campfire or in their slave huts in Egypt. They’d laugh at the through of their umpteenth great-granddaddy, the trickster, pulling this stunt off against Laban, who was also a trickster. Read Genesis 30:25-43. “Now that Joseph is born…” our story begins. Joseph is the wanted child. Even though Jacob already has a quiver full of boys, which the Psalmist says is a sign of a blessed man, Jacob has been waiting for this one child. Up until this point, Jacob has had children with his first wife, Leah; with Bilhah, Rachel’s slave; with Zilpah, Leah’s slave. But the light of his eye, Rachel has yet to conceive. Now she gives birth and they name the child Joseph. And as you know, this child will have his own challenges, but he is the one who will save his family. He is the child of the promise. Without him, Jacob’s dream of a nation from his descendants will not happen. With Joseph in diapers, Jacob feels it’s time he head back home. Remember the dream of the stairway to heaven, as Jacob was fleeing his brother’s wrath? Jacob was assured he would return home and now he is ready. So he approaches his father-in-law and asks to be released so that he and his family and their flocks may return home with him. You got to love Laban. Hearing this, he goes on about how he’s been blessed because of Jacob. It’s Jacob’s God that is the one who has seen to it that his flocks have multiplied. Laban response demonstrates a truth I have found in life. It’s not the main truth of this passage, but kind of a second kernel of truth we can take with us. If you are doing business with someone—say buying a car—and they start talking about God, hold on to your wallet! Those who talk the talk the loudest often don’t walk the walk. Sometimes it’s just a sales pitch. As Jesus says, be wise as serpents and gentle as doves. Don’t be fooled by smooth talk! Watch out for the Labans of the world. And in our own lives, make sure that our actions demonstrate Jesus’ values, and that we show humility before we engage in God talk! Jacob offers a unique deal to Laban. He’ll take the animals that are stripped or spotted, Laban can have the rest. This is a great deal for Laban. After all, the “unblemished animals” would be worth more. Laban jumps on it. “Sounds good,” he says, as he whispers to his sons to round up those spotted and stripped animals, along with the black ones, and move them to distant pastures. He wants them to be far from Jacob’s eyes. Even while agreeing to this deal, Laban is planning deceit. Without any spotted animals and without any black sheep, it is highly unlikely the remaining “white sheep” will give birth to spotted or stripped animals. But Jacob has a trick up his sleeve, too. He pulls off a magical stunt, having the animals mate in front of stripped sticks. Obviously, there was some belief that animals who mated in front of such sticks would give birth to animals with strips and spots. And he only mates the strongest of the flock, for there was no need to weaken his flock with the genetics of Laban’s weaker animals. Now, there is no science behind these streaked sticks, although there is science behind breeding strong with the strong. Those listening probably laughed at Jacob fooling Laban, but they also understood that ultimately it was God blessing Jacob by causing the stronger ewes and does to give birth to strong spotted and stripped lambs and kids. With a new flock, despite Laban’s best attempts to cheat him, Jacob is now set to make his journey back to his homeland and to encounter his brother. Of course, there will be more encounters with Laban (and Laban’s gods). We’ll look at those over the next two weeks. This is, at least on the surface, not an overwhelmingly religious text. God is only mentioned twice. Once by Laban at the beginning, when he attempt to pull a fast one on Jacob. And then a second time by Jacob, when he acknowledges that it is God that has caused the blessings that have come from his time working for Laban. Even though God is only mentioned in passing, God is there, working behind the scenes. God blesses Jacob! God’s blessings often require patience. God teaches by delayed gratification. God doesn’t instantly answer our prayers. Nor is God a Santa Claus, coming around once a year with goodies if we’ve been good enough. 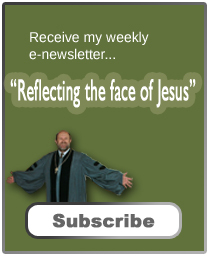 Sometimes it seems as if God is all about delayed gratification. 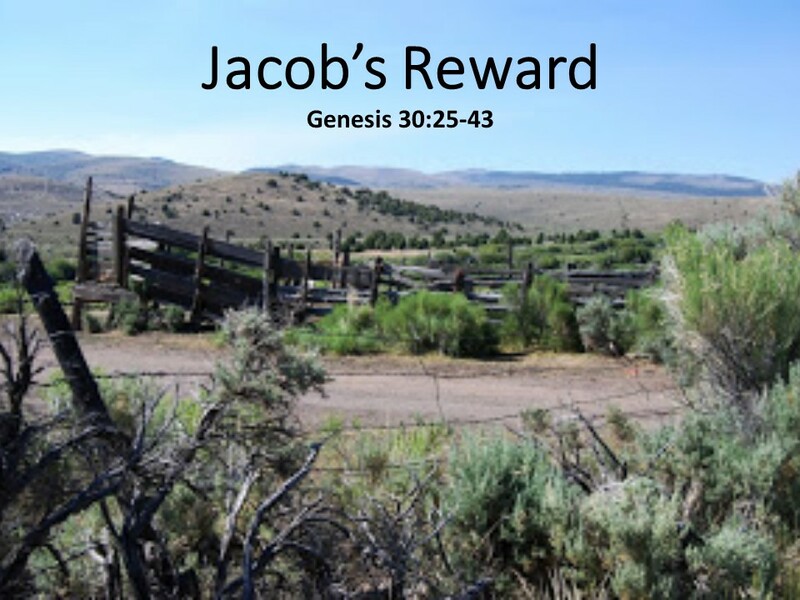 In Jacob’s life, it was twenty years before he had a full family and a strong herd. Twenty years, that’s a long time to wait, but God works that way. We have to be patient and trust as we go about our lives. 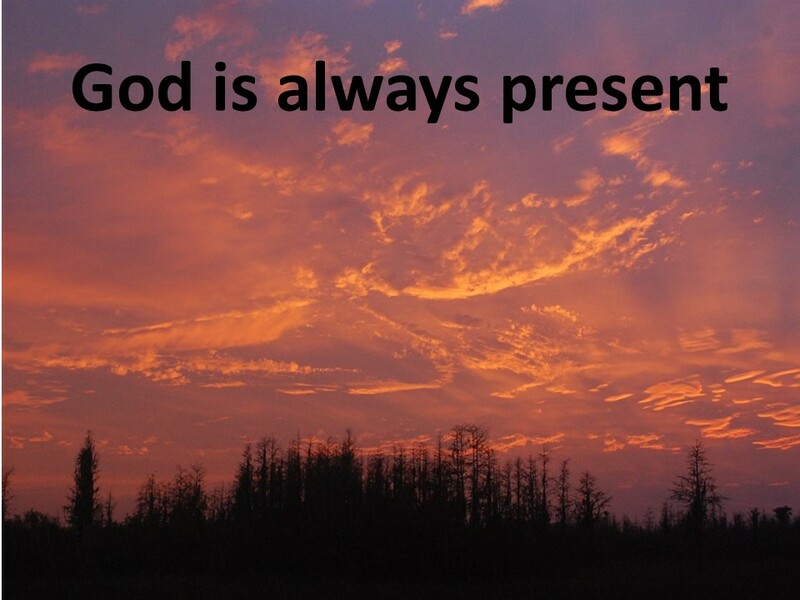 God is present throughout the waiting. Maybe it’s because God wants us to appreciate what we have. We don’t always know what’s going on, but we live and walk by faith, trusting the Lord. Amen. Gerhard Von Rad, Genesis, revised edition (Philadelphia: Westminster, 1962), 302.